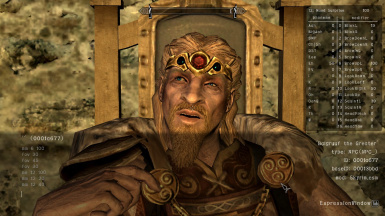 This mod resurrects "mfg phoneme/modifier" console command and PlayerBlink at Skyrim ver.1.9.32 again. And add some information window, some commands and customizable command-alias to console. Mfg Console - Cyrillic Fix Don't forget about required materials for it. You are allowed to upload, convert, modify this mod. You feel free to use this mod to include your mod, No need to contact me. 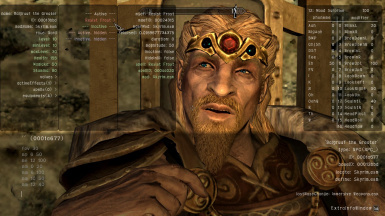 This mod resurrects "mfg phoneme/modifier" console command and playerBlink at Skyrim ver.1.9.32 again. And add some information window, some command and customizable command-alias to console. - show objectName, formID, baseID, sourceMod, lastModifiedMod, respawn-container or not, characterStatus, activeEffects, equipments etc. drop the "data' folder into your Skyrim directory. If you do not want to install the console update, please exclude "Interface" folder. This mod shows an additional information window on the left side of screen when select an object at the console. Support character, weapon, armor, potion, scroll and container now. Some entries have a child window (added " >" on the right of entry). Move mouse cursor on the entry and tap "Shift" key. If entry have no more information, do nothing. This window is enabled by default. If you want to disable, set in the configuration file. You can enable on console with "enableExtraInfo" command. This command is valid until you restart the game. PlayerBlink is enabled by default. If you want to disable, set in the configuration file. You can enable/disable on console with "playerBlink start" or "playerBlink stop" command. This command is valid until you restart the game. Select character (include player) at the console and type "mfg phoneme/modifier * *" same as TESV-Ver.1.8.151. These effects will take effect after you exit the console. You have to execute "mfg reset" on the character to reset face after change expressions, or reboot your game. If you want to save expression, enter "mfg save 'filename'". Saved file is 'filename.txt' in Skyrim directory. To revert expression, select character at the console and enter "bat 'filename'". This already sets some command-alias, "me","mp","mm" to "mfg expression","mfg phoneme", "mfg modifier". If you enter "mp 1 100", execute "mfg phoneme 1 100". You can add your own alias easily. Open "datainterfaceconsole_alias.ini" by text editor, and add "alias, execute-command" pair. You can get all weapons/armors added by mod at once. Select container on console and enter "getModItem mod", and this adds all weapons/armors added by mod into that container. "getModItem vanilla" "getModItem dlc" add vanilla/DLC weapopns and armors. This command adds very many items (about 5,000 at vanilla), do not choice your favorite container and container in your home. After you have finished, run "removeAllItems" command on the container will be good. - This mod cannot stop expression of AI, character face will blink when NPC will speak or so. - Extra information take a few seconds on game startup for search mod IDs. - Cannot get Enchantment of weapon/armor now. - Cannot get the name that you gave to the enchanting, show original name now. This mod includes some Papyrus functions for change expression.